Are you tired of carrying around all sorts of cables for your laptop, Visor, and accessories when you travel? Don't want to carry around a HotSync USB cable when you need to synchronize your Visor with your laptop on the road? If so, the Landware GoType! keyboard could be for you. The GoType! keyboard is an all-in-one keyboard that is designed for the mobile professional. The keyboard is clam shaped in that a protective hood closes over the keys when you are not using it. Open the hood, and insert the Visor into a special cradle. The hood also has a foldaway latch that allows you full access to the back of the Springboard module for those times when you use oversize Springboard modules. At the back of the keyboard is a "foot" that you can pull out to provide extra stability when you type. There is also an included USB cable that lets you connect the keyboard directly to your computer's USB port, alleviating the need to carry a HotSync cable/cradle with you when you travel. At (insert dimensions), it is about the size of some of the sub-notebooks currently on the market. The keyboard has holes near the special buttons on both sides of the keyboard where you can keep your stylus as you type. The keyboard layout is 85% size standard QWERTY, with a key travel of 2.3 mm. 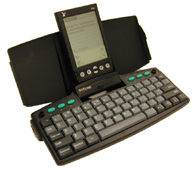 There are customizable keys for the Datebook, Phone, To Do, and Memo applications, and an Alt key for special commands. The layout for the arrow keys has them next to each other in a row of left-right-down-up. The GoType! does not come with any case because of the protection that its clam shell provides. For those that are interested in cases, Landware has several optional cases that can carry the Visor and the GoType! in one case. There are various dedicated keys and keys that are enabled by the Alt key. Some Alt-combinations are specifically labeled, while others you will need to look up in the User's Guide or find on your own. Below are the keys that you will find on the GoType! keyboard to use as a comparison against other keyboards. » Size 10" x 4" x 1.5"